Posted on 7/16/2013, 8:55 am, by Alexampersandra, under General Projects. People who love books want the world to know about it. What better way to tell them than to – literally – wear your books on your sleeve… or other pieces of clothing? 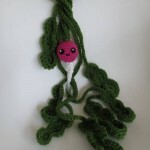 Witwitherwilt is a writer who wanted to do something extra-special to a book festival to promote her own book. So she made a dress that was adorned with pages of the book! Susieinthesky posted her first-ever knitting project (which she says took four years) which was a long Harry Potter scarf in Gryffindor colors! 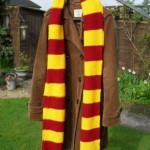 Another Harry Potter inspired scarf comes to us from pottermouth, who made a radish scarf reminiscent of Luna Lovegood. 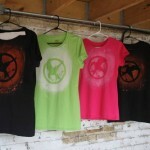 Smashtastically made several Hunger Games shirts using a mockingjay symbol stencil and bleach. 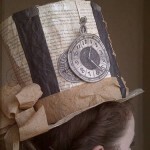 Angelprojekt tops it all off with a steampunk hat that uses old book pages as one of the major elements! 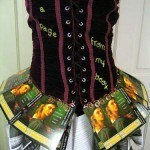 So, Craftsters… how do you wear your books? « July 15th – Cow Appreciation Day!